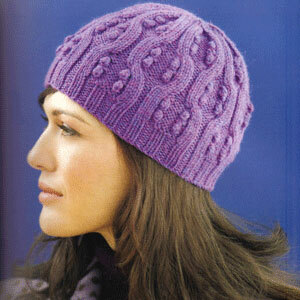 Taken from 60 Quick Knits: "Knit in a beautiful amethyst heather, this cozy hat is no shrinking violet. The cables flow naturally from the ribbed band, and paired bobbles add extra texture." The pattern is in 60 Quick Knits. Size US 6-16" and 7-16" circular needles, US 7 dpns, and cable needle, not included. Finished Size: circumference 21 in., slightly stretched. Gauge: 20 sts and 28 rounds to 4 inches. Color Shown is #9453 Blueish Purple. $23.20 -- Kit price including yarn and pattern book.